Living with heart disease is challenging. Those who suffer from it need hope that one day, there will be a cure found for what they're struggling with. Our heart throw pillow is a little something that you can give them to show that you support their struggle and that you're praying for a cure with them. This Heart Throw Pillow measure 14" x 12.5" and is 4" thick. The pillow has a removable stuffing pillow insert with a zipper that runs 9" from the top on down of each side. It is available in pink or red. Free personalization of any name is included. Today’s Price: $40.99 Temporarily out of stock. Please check back. Additional Info February is Heart Disease Awareness Month. 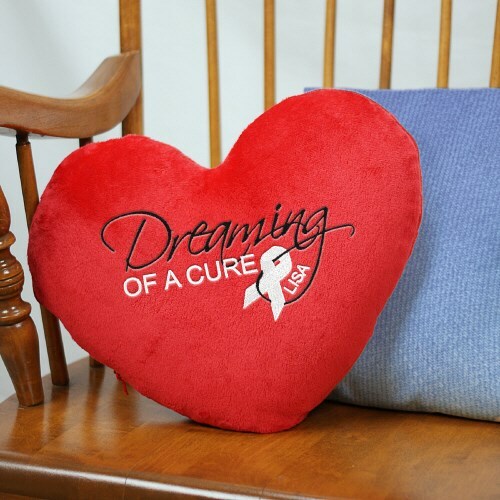 Show your support for friends and family members who are currently battling some form of heart disease by giving them a gift that will give them hope, like our Dreaming of a Cure Pillow.